Shawnee businessman Paul Milburn's passion for giving led him to establish a private foundation to support the charities he cared about. In 2007, he transferred the assets of his private foundation to the Oklahoma City Community Foundation, ensuring that his support of the community would continue in perpetuity. A graduate of Fairview High School, Mr. Milburn earned both his bachelor's and master's degrees from Oklahoma State University. Following a stint in the U.S. Air Force, he began his career as a teacher and administrator at vocational centers before launching a successful land development business. In 2007, he transferred the assets of his private foundation to establish an Advised Fund at the Oklahoma City Community Foundation. Since then, he has created additional funds through the sale of real estate and has established several charitable gift annuities. 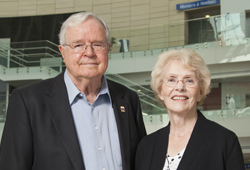 Mr. Milburn and his wife, Ann, are longtime supporters of Children's Hospital Foundation, providing funding for four endowed chairs. Established in 1983 as Children's Medical Research Institute (CMRI), the foundation is the only nonprofit in Oklahoma whose sole focus is the advancement of pediatric research and education while supporting specialized clinical care for Oklahoma's children. The Endowed Chairs Program is what drew Dr. Kenneth Copeland to the hospital 14 years ago. Dr. Copeland cares for children with diabetes and is the CMRI Paul and Ann Milburn Endowed Chair in Pediatric Diabetes/Endocrinology. "This extraordinary program does not exist anywhere else in the world," Dr. Copeland says. "The program generates funding each year to support our new and ongoing children's diabetes research projects while the corpus of the gift remains intact for generations to come." The Oklahoma City Community Foundation offers several fund options that provide an alternative for donors who are considering establishing a private foundation. Our Advised Funds can be established with a variety of assets and we take care of all administrative and legal requirements. For more information on how we can help your clients accomplish their charitable giving, contact Joe Carter at 405/606-2914.